Today it is with great honor and pleasure that we are finally announcing the release of FormulaPro ! Here are the technical details : FormulaPro is a TI-Nspire (OS 3.x) document whose main content is a Lua script. Yep, all made in Nspire-Lua (http://www.inspired-lua.org). Indeed, it is the only way so far / right now to "properly" achieve what we do on FormulaPro (completely graphical UI, math calculations...). 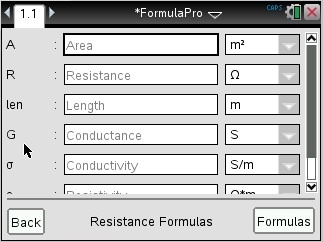 FormulaPro is also free, of course, and open-source (https://github.com/adriweb/EEPro-for-Nspire/) (LGPL license) ! Hmm ok, but what does it do ? Well, here you go : some of you may already know what's called "EEPro" or "MEPro" for the TI-89 and TI-92. 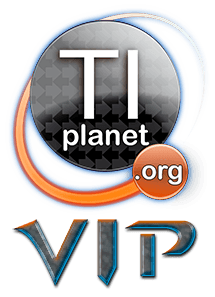 It is an official program that TI puts in the 89 by default. If you don't know it, EEPro-89 is basically a program described by TI like this: "This application solves the problems of electrical engineering. It is composed of three modules: Analysis, Equations (700 equations grouped into 16 subjects) and Reference. " 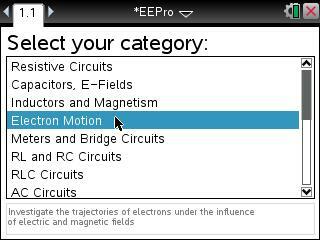 In short, a complete and very powerful application about Electrical Engineering. 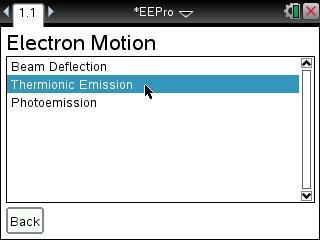 Well, FormulaPro is the 2nd part ("Equations") of our project to port the EEPro-89 suite to the Nspire. to be able to solve intelligently solve the equations it's given, contrary to the 89 version, where the user had to select what equations had to be used : Indeed, here you just have to enter what you know already, and it will automatically try to solve for what it can. it can show you the used formulas of the current sub-category in "PrettyPrint"
Great ! How do I use it ? Be sure to run Nspire OS >= 3.0. We recommand version 3.1.0.392. If you were on the online generator, click the "Generate" button at the bottom of the page. Transfer the .tns to your calculator or in the computer software and open it. Select the category and the subcategory, and begin filling the input fields of the data you already know. Press enter or change focus, and it will start auto-solving. Here are 4 screenshots showing pretty much all of FormulaPro. They are not related to each other. In general, the plan is to be able to do everything (and more !) that the TI-89 version can do. Input data directly into the solver using Vernier sensors! Thank you! I have been waiting for this program however, it does not work correctly on my handheld. The document opens and works fine for the student software, but when I open the file on my handheld and try to click one of the choices my handheld locks up and freezes. I am not sure if it has anything to do with my OS which is the new 3.2. Any suggestions? Hi, I actually got it working. It seems that the movement of the mouse cursor needs to be used instead of clicking. Great work! wizdumb wrote: Hi, I actually got it working. It seems that the movement of the mouse cursor needs to be used instead of clicking. Great work! First, I'm running 3.2 on my handheld, and have not encountered any mouse related issues ? For now, just press Enter to navigate. We'll fix that as soon as possible. Thank you for the link. It did not fix my issue entirely, but it's no problem as I can live with it since I am able to use the enter button and it is a much needed program for my studies. Again, I appreciate all the efforts you guys have put into the program. wizdumb wrote: Thank you for the link. It did not fix my issue entirely, but it's no problem as I can live with it since I am able to use the enter button and it is a much needed program for my studies. Again, I appreciate all the efforts you guys have put into the program. • Enter in a variable for a value instead of a number. • Enter a global function for a value. 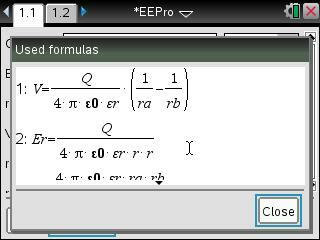 • Copy the formulas and paste them into another problem/page. If not, could the lua script be edited somehow to allow this? Also, the website to build a database (http://education.bwns.be/FormulaPro/) is not working anymore.